The Keystone oil pipeline may have won approval from Nebraska's governor Tuesday, but the final decision rests with President Obama. And after the heavy emphasis on climate change in his inaugural speech Monday, analysts say Obama is likely to feel even more pressure to reject the pipeline. "By elevating climate change, he risks backlash and calls of hypocrisy if he promptly approves the pipeline," said Divya Reddy, an energy and natural resource analyst at the Eurasia Group, a political risk consultancy. In the end, most analysts still expect Obama to approve the pipeline. But the chances that he won't are increasing. "We expect the inaugural address will invigorate pipeline opponents," Whitney Stanco, an energy analyst at the Guggenheim Securities' Washington Research Group, wrote in a research note Tuesday. The expansion of the Keystone pipeline has touched off an intense debate in the United States. Supporters like it because it will carry 830,000 barrels a day of oil from Alberta, Canada, to the U.S. Gulf Coast -- potentially reducing imports from other, more volatile areas. Its construction is also estimated to create some 5,000 jobs, according to the State Department. The company building the pipeline, TransCanada (TRP), estimates even higher job growth. Opponents hate it because oil from Canada's oil sands region produces between 5% and 30% more greenhouse gases than other types of conventional crude. Extracting the oil sands also uses massive amounts of water and can result in deforestation, and transporting it raises the possibility of spills. It was the spill concern that derailed the project last year. The pipeline's original route had it going over Nebraska's environmentally sensitive Sand Hills region, and many state lawmakers opposed it. The concerns allowed Obama to delay his decision, especially as it became a hot-button election issue. On Tuesday, Nebraska Governor Dave Heineman said state officials had concluded that the pipeline's new route poses minimal risk to the environment. That clears the way for the State Department, which has final say, to move forward with their own environmental review. A State Department official indicated Tuesday that a decision would come shortly, but probably not before the end of March. 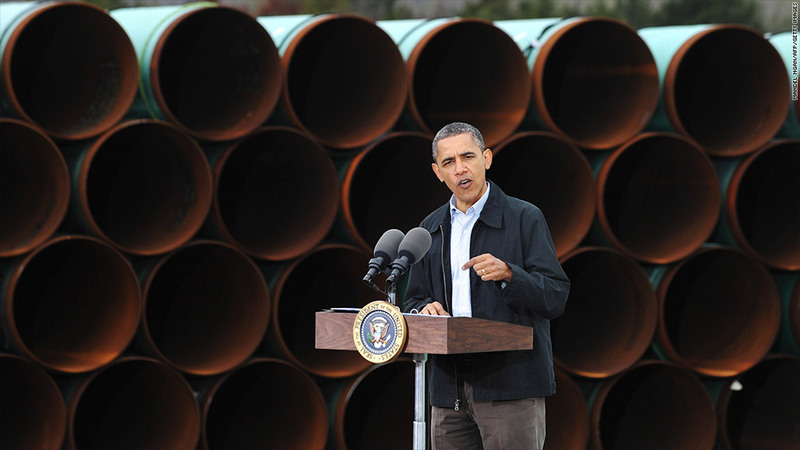 As predicted, Obama's focus on climate change during his speech Monday galvanized the pipeline's opponents. "Approving Keystone XL would make a mockery of the commitment he made at the inauguration to take action on climate change," May Boeve, head of the environmental group 350.org, said in a statement Tuesday. Opponents are planning a protest at the White House February 17. Still, analysts think Obama is leaning toward approval. Reddy noted that the pipeline is strongly backed by the unions -- big Democrat supporters -- and that the presumed incoming secretary of state, John Kerry, "probably won't want to intervene in such a controversial topic so early in his new post." Others think it could be used as a bargaining chip. "Approving Keystone, possibly with additional conditions, at the same time that EPA proposes new standards for greenhouse gas emissions from existing power plants would line up with the recent trend of 'give a little, take a little' energy policy," said Kevin Book, managing director of research at ClearView Energy Partners.